The Only Bubble Show Where EVERY CHILD GOES INSIDE THEIR OWN BUBBLE! Dr Bubble and Milkshake are a much loved fringe highlight who create a brand new extravaganza of soapy goodness every year. Square bubbles, smoke-filled bubbles, giant rainbows, carousels that actually spin, vortexes, juggle bubbles, bubble snakes, floating bubbles and a million bubble finale. An unbelievabubble reinvention of The Little Match Girl not to be missed. This years show sees Dr Bubble retelling of a classic children's story to get Mini Milkshake to go to bed. Like bubbles in bubbles its a story within a story filled with wonderful puppets, laughs a minute, bubbles that will have your jaw dropped. 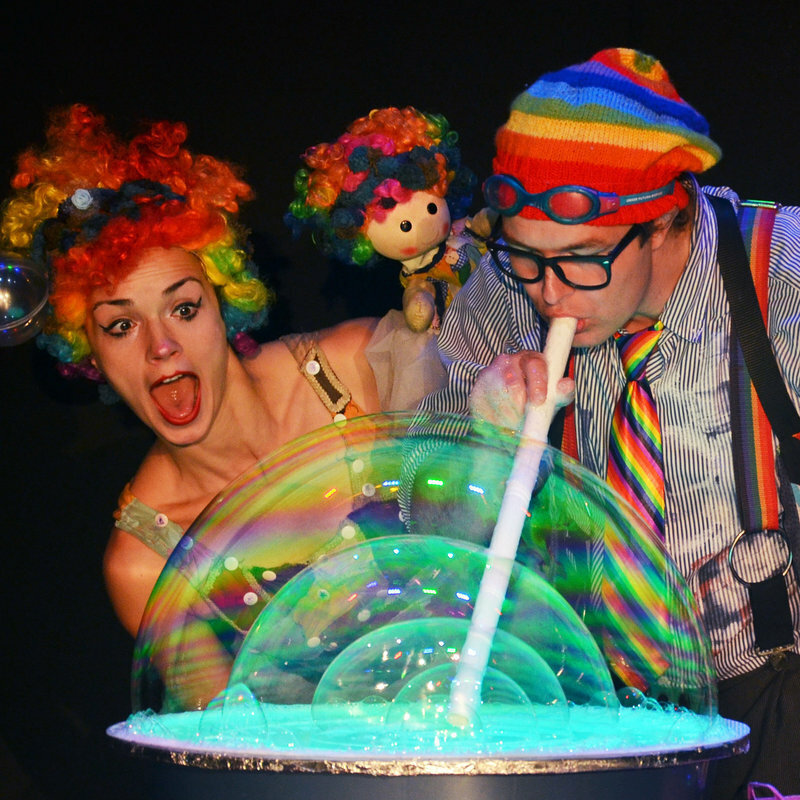 Bubble Laboratory Dr Bubble and Milkshake is a five star reviewed, award nominated theatre company that creates bubble theatre shows for families and children filled with colourful characters, exciting storylines and amazing morals to build a better world. Every year we create a brand new bubble adventure for the stage and travel all over the globe sharing fun and joy with bubble artistry. We also do amazing Street Theatre Shows for festivals and events, cabaret shows for the grown-ups and workshops for kids who want to learn the magical art of bubbling too.